When a superstar beckons, we answer. 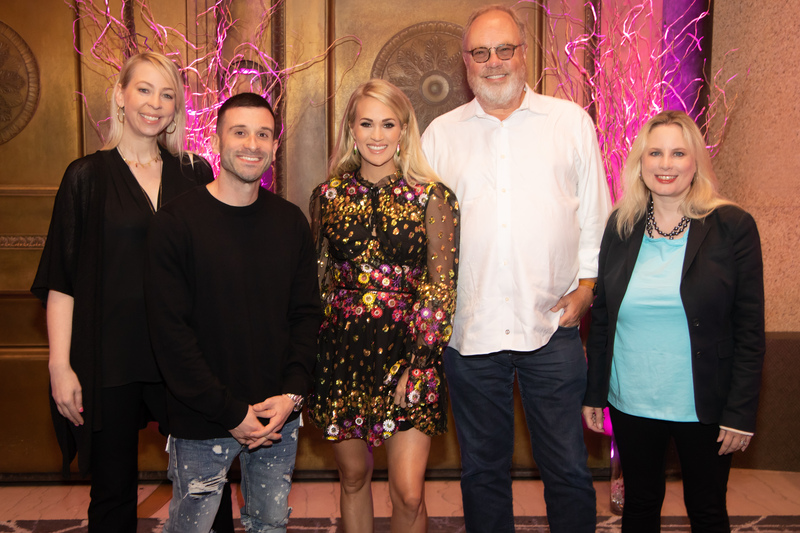 “We,” in this case, was the throng that gathered on Monday evening (Aug. 20) to listen as Carrie Underwood’s forthcoming Cry Pretty album echoed in the polished, stone-and-cement interior of the Parthenon. Expectations were high, since this was her debut effort for her new label, Capitol Nashville. The diva took the stage with tears flowing. “The waterworks have already started,” she stammered. “She didn’t say anything about ‘poise,’” she added, referring to Cindy’s intro. Carrie sat at stage right. Her baby bump was showing in her sequined gold-and-black cocktail frock. Husband and expectant father Mike Fisher sat quietly beside her throughout the night. “As you can hear, we covered a lot of ground,” said Underwood, at this halfway point in the listening session. “My partner in crime throughout this whole thing has been [co-writer and co-producer] David Garcia.” This is Underwood’s first venture as a co-producer. Of the latter, Allen Shamblin, Tom Douglas, Hillary Lindsey, Brett James, Josh Miller, Marc Beeson and Chris DeStefano were in the house. Carrie and David co-wrote six of the tunes with a number of them. Project engineer Joe Baldridge was also beaming in the crowd. During the cocktail hour, we snacked on “East Nashville sliders,” which seemed to be mini burgers with pimento cheese. The wait staff also circulated with fried-avocado tacos and cilantro-tomato salsa on toast points. A tower of plates held a plethora of mini desserts. “We” mutually schmoozed R.J. Curtis, B.J. Hill, Rod Essig, Sherod Robertson, Rondal Richardson, Fletcher Foster, Jon Freeman, Jody Williams, Joanna Carter, Jessica Nicholson, Ashley Eicher, Becca Walls, Chuck Aly, Deborah Evans Price, Eric T. Parker, Leslie Fram, George Flanigen, Hunter Kelly, Donna Hughes, host-with-the-most Mike Dungan, Nick DiFruscia, Tiffany Dunn, Bobby Young, Terry Wakefield, Mary Lauren Teague, Lisa Konicki, Lon Helton, Phyllis Stark, Steve Buchanan and Sally Williams. Like I said, “we” all answered the call. That included the comely trio Runaway June, who will be an opening act on Carrie’s “Cry Pretty” tour. We perched on Lucite banquet chairs. Pink-and-gold balloon garland encircled the hall’s classical Ionic columns. Yards of gold and black drapes flanked the walkways. Fuchsia-toned up lights cast shadows. The cocktail tables wore crimson skirts. Cry Pretty drops on September 14.